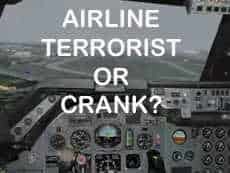 Home Thoughts Opinions Nigerian Airline bomber – al-Qaeda terrorist or lone crank? Nigerian Airline bomber – al-Qaeda terrorist or lone crank? Before the creation of al-Qaeda and the heavily promoted “war on terror,” the world often saw planes hijacked or subjected to attacks by a variety of individuals. Some of those involved were working for small terrorist groups, making political demands, whilst the majority had more personal agendas. However, if we are to believe all that we are told, it would seem that all acts of terrorism now have links to al-Qaeda. With the exception of ETA, how often do you read about terrorist groups in the mainstream media that are not “connected” to al-Qaeda? It is also curious that “al-Qaeda,” unlike terrorist groups in the past, rarely seem to make any demands before carrying out an attack and the general public never seem to question what it is they seek. If al-Qaeda is simply killing people to create fear and “terror,” what is the ultimate purpose? Surely, it can’t be to help promote the Islamic faith throughout the western world, we only have to look at Britain to see that Islam has become very powerful without the need for violence. Why would any Muslims want to jeopardize that success with acts of terrorism? Maybe al-Qaeda wants to force foreigners from their lands? But didn’t most of the invasions happen after 9/11? According to the latest “terrorist attack,” a Nigerian student, Umar Farouk Abdul Mutallab, flew from Lagos, Nigeria to Amsterdam and then took a Northwest Airlines Airbus flight to Detroit. Shortly before landing at Detroit, Mutallab attempted to ignite some kind of bomb that was attached to his body. However, he was overpowered by passengers and crew when the device failed to ignite properly. Mutallab is said to be receiving treatment for burns. Within hours of this incident, we are told that he used to be a student in London (one and a half years ago) and an address was found where he has been residing. We are also informed that he is on some FBI list as a potential terrorist (having been watched for 2 years), yet he was allowed to pass through Lagos and Amsterdam airport security without any problem. It seems that the authorities and media had, or were able to obtain, a considerable amount of information on Mutallab (within 24 hours), even though his movements were not restricted in any way. It would also appear that Mutallab is the one suggesting a terrorist connection, not the intelligence agencies, which may indicate he was nothing more than a crank seeking attention for his personally motivated actions. Many people seek “fame” by fraudulently claiming to be involved with well known organisations, and the US intelligence agencies have a habit of “listing” people who do not fully support the official line. Thousands of internet sites are monitored daily (including mine), because they dare to question stories like these. I believe it is most unlikely that Mutallab has any al-Qaeda connections (despite his own admission that he has) and is more likely to be a dangerous attention seeker who dreams of entering the history books as an infamous hero. Alternatively, he might just simply be a fool who was encouraged to do what he did for some misguided glory? Whatever the reason, the “War on Terror” promoters have yet another opportunity to frighten the public into thinking that the al-Qaeda threat is real. It is no coincidence that this happened on a US plane, or that Mutallab is/was based in the UK, as these are the two countries that promote action against al-Qaeda the most (an organisation allegedly created by the CIA). Promoting the “terror threat” is designed to make past actions (invasion of Iraq and Afghanistan) more acceptable to the public, something Tony Blair will be hoping for before his appearance at the Iraq Inquiry soon. It is also expected to give support for an attack on Iran and many of the future terrorist attacks will attempt to make a connection to this country (more than they have in the past). At the end of the day it is all about the oil and the countries that will host the pipes to carry it. These countries only became a “danger” when they refused to allow western oil companies to control their resources.